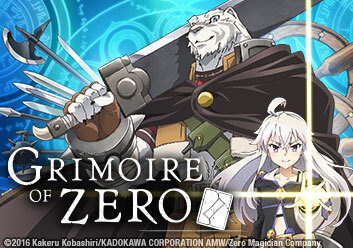 A witch, Zero, is searching for a magical tome that can destroy the world..She’s guarded by a half-beast mercenary wishing to become human again. They strike a deal: he will offer his protection to her during her journey, and in exchange, she will transform him into a full human when she achieves her goal. With the agreement in place, they set out to travel the world and find the missing “Book of Zero”. A witch, Zero, and a half-beast, Mercenary, form an unlikely alliance to begin their quest. Meanwhile, they are being stalked by a mysterious figure. Albus joins Mercenary and Zero. With the new member in tow, the group heads out to a new village, but not all goes as planned. The group arrives at the city of Formicum where they look to stay and rest. While there, Zero and Mercenary run into some trouble. As they make their way to Latette, Mercenary teaches Zero about different aspects of the world while also warming up to Albus. The three start their investigation into the massacre in Latette, leading Zero to meet someone from her past. Thirteen and Zero are determined to finish what they started. Meanwhile, they learn more about Thirteen's intentions, including why he chose to become Sorcerer of the State. Zero, betrayed by Mercenary's doubts about her, dissolves the agreement. Now alone, Mercenary finds himself helping out a young woman with a Beastfallen problem. Mercenary learns more about Holdem's past while tending to his wounds. Meanwhile, Thirteen has sinister plans for Albus. With Mercenary, Holdem, and Albus on the run, they must figure out a way to free Zero from Thirteen's clutches. Mercenary tries to save Zero from Thirteen, only to have his plans compromised. Meanwhile, Holdem and Albus face their own problems as they try to escape their captors. Zero and Thirteen faceoff with Mercenary looking on. Meanwhile, Albus is still looking for a way out from her captor's grasps. The battle for Wenias has begun! Will Mercenary and Zero's plan come to fruition or will it fail?